Dry roast all ingredients till golden brown. Dry grind coarsely and store in an air-tight container. 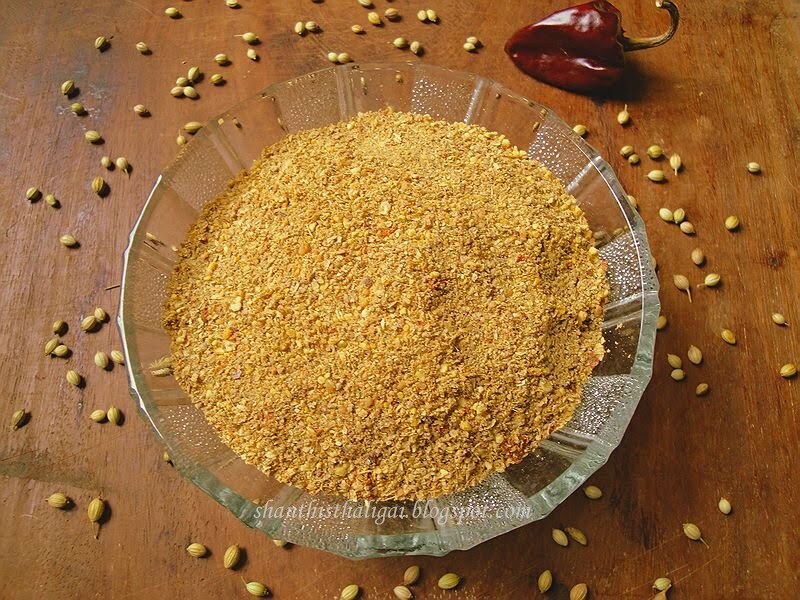 NOTE: This powder is used for making saaman podi (podi idicha) karamudhu (curry) varieties, in addition to the regular curry powder, to enhance the flavour and taste. Tastes good for curries made with brinjal, capsicum and raw banana. Hi Shanthi, thank you for sharing the curry powder recipe. It look good. Like this. I can imagine how good the curries would taste with freshly ground powder. Bookmarking it. I am getting impressed looking at your blog. SO MUCH of recipes with perfect labeling! I would like to try few Jain recipes from your blog. Will notify you before I post them. What would we do without all these curry powders, amazing! Definitely a must in my pantry too,love this podi. Very traditional & flavorful powder.. Thanks for stopping by my space and leaving a comment. Such a nice blog you have maintained. Good work. From now on I am following you. I guess this podi is packed with flavours. will definitely try this one. i willl make this podi. It is very useful too.